My guide to "putting it on the boat". Don't forget your towel. On Sunday, my class had a year end party at White Haut, a location that I've mentioned before on this blog (I apologize they do not have a website that I can direct you to). It was a fabulous night were we were able to socialize together and interact on a non-professional level. Thanks to Jamie, our event organizer, we had free drinks, sushi, and a fabulous location. It was a great night. Thank you Jamie. Around 11 o'clock, one of my favourite local talents, LMT Connection got on stage and I had to break out the moves and start dancin'. For many of my classmates this was the first time they had seen my truly dance and I think I may have surprised them just a bit, not by my fabulous moves, by no means, but instead by the fact that I actually danced. I wont dwell here long, but my favourite comment of the evening was from one classmate who compared me to Elaine from Seinfeld. In one episode Elaine goes to an office party and when the dance begins, she starts to bust a move on the dance floor. Everyone around her is shocked by her erratic movements, all the while, Elaine is under the impression that she is a really good dancer. At the end of the episode she realizes that her dance moves are not favoured by many and in fact she is a point of mockery. (See below for a taste of the hilarity). Now I will admit, I'm not the best dancer in the world, but I really hope that I'm not that bad. My philosophy is that it doesn't matter if you are a fabulous dancer or a mediocre dancer, I think that those who truly dance show up anyone who is barely dancing at all. Next time you see someone who is dancin and you find yourself pointing the finger and laughing, I urge you go out and join them. From my stand point it's better to be making a fool of yourself and truly be dancin then to not dance at all. And who knows you may just discover the Elaine in you too. Thanks classmate for reminding me to keep dancing like no body is watching. Club Heidleberg. Saturday night. We arrive at 7 p.m., the time that the dance was to begin. As we walk into the hall we are quickly stuck by the number of round tables occupied by retired, white haired, old folks. Bless their hearts for being there, but we were not expecting that kind of company. I don't know what we were expecting, going to an old German social club, but for some reason it wasn't this demographic. We were there for a swing dance and after about an hour of waiting at our big round table, we were slowly joined by some other friends, and also a few other people our age. By the end of the night, the young swingers out numbered the seasoned dancers and so we felt in good company. For about half an hour we had a dance lesson, taught by Mandy from Bees' Knees Dance and she was fabulous. She taught us the lindy-hop which was a new dance for us. After much trial and error, I think we got it and nearing the end of the night we were dancin'. Now, the funny part of the story came at about half way through the night. For the majority of the evening the Lincoln and Welland Ambassadors, a 12 piece big band was our live accompaniment. They were very impressive and provided superb swing music to dance to. About one hour into their playing, the leader announced, "Alright folks, we are going to take an hour break and invite Jennifer to the stage and her and her keyboard are going to take over." For the next hour, Jennifer and her keyboard indeed did take over. She pressed a button and "tada" a full band and boy, did she sing her heart out. To give you an idea of what it sounded like, one of our friends compared it to being on a really cheap cruise...around Lake Erie. Needless to say we had a hard time, truly dancin' to her tunes. One thing that she did teach me though, was the value of doing something you are passionate about, with everything within you. Kinda like me and dancin', she was truly singin'. Thanks Jennifer for giving it your all. Do you have one song that always gets you on the dance floor? The one that, no matter where you are, if you hear it you just have to move? For me I have many songs like this, but my absolute favourite is "Love Shack" by the B52's. It is a classic 90's tune and for some it makes them gag, but for me, it gets me soo excited that all I want to do is dance. Now, the embarrassing thing about the effects of this song on me, is that I go wild, and don't really know how to control it. There was this one time when Brent and I were at his cousin's wedding and I requested this song from the DJ. When the song came on there was about three people on the dance floor. I jumped to my feet, dragged Brent with me and started to dance, confident that in no time the floor would be full of people. I danced, and danced, did circles around Brent, and was truly dancin', holding nothing back. About half way through the song I slowly started to clue in that not a single person joined us on the dance floor and I was the only one actually dancing. To make matters worse the only other people on the floor were these college age guys, who were awkward and that much more awkward just watching me make a fool of myself. Nevertheless I kept dancin' and I am proud to say, much to Brent's dismay, that this was probably one of my most memorable moments where I was truly dancin', without any restraints. To put it into perspective, I would have fit in perfectly in this video, minus the fabulous 90's outfit. Last week I mentioned Social Ease Dance Studio and the Latin dance lessons that Brent and I have been attending. 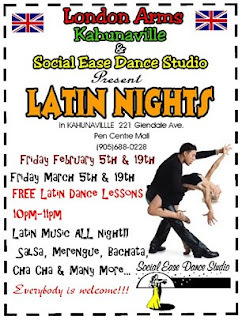 This week, my friend Emily invited us to go join her and the studio at Kahunaville for a free Latin dance lesson and then a social dance. I am always up for a dance and so after some persuading Brent and I made our way to the bar. We arrived a bit late for the event and so the lessons were in full swing. This typically would have posed a bit of problem for Brent and I, seeing we don't always catch on fast. But, this night was different, because we actually knew the steps before hand. They were teaching steps that we already knew and when they came to something new we had the background knowledge to fall back on. This made for such a great night. We, in a sense, we had practiced the steps before hand that meant that we could really dance. For me, that means, letting everything go, forgetting my feet and letting the music take me where it wants. It was a fabulous night of great music, good people, and a night full of dancin'. I'm not sure if that would have been true if we hadn't practiced. Thanks to our practicing, we weren't only dancing, but we were dancin'! Here is a video to help you get started in your latin dancing practicing. This story started when I went to a Halloween dance at Social Ease Dance Studio. My dear friend Emily had been a member of the studio for years and finally I had the chance to see what all the fuss was about. While I was there I was convinced to sign up for a deal that gave Emily one free lesson and me two, one hour private lessons. This was the beginning. My husband Brent and I went to the two private lessons and had a great time. At the end of the two lessons, our instructor tried to persuade us to signing up for a huge package dance deal. Because we are poor newlyweds, we unfortunately were unable to sign up. We left the studio thinking we were done our days as Social Ease. Jump to the Christmas holidays. On Christmas Eve I got a phone call from the studio and at first I was very confused as to why they were calling. After some time I realized that they were trying to sell us another package deal: eight weeks, Latin dancing, $100. I hung up the phone and bashfully asked Brent what he thought. Immediately he agreed. I was shocked yet beyond excited. We are now on week six of our dance lessons and are absolutely loving it. The thing that makes it so good though, is my partner. Brent is an incredible partner- the best partner. He would be the first to admit that he's not the best dancer in the world, but he is more than willing and that makes all the difference. When I'm with him I feel free to really dance and give it my all. When I'm in his arms, I feel like I am on a grand stage and each twirl I do with flare, and each step I do with zest. When I'm with Brent and I'm not only dancing, I am dancin'. Brent you are fabulous. Thanks for being the best partner a dancer could ask for. I love you. Unfortunately this week my dancing experiences were next to non-existent; however, I was reminded of an experience that I had a few years ago. Before I tell you about the dance let me give you some background. My dear friend Jon is a crazy, crazy guy. He loves to do things outside of the box and has no care in the world about what others think of him or how he may be judged. He is a free spirit enjoying life to the fullest. He is an inspiration to me and the right person to have around when you want to have a good time. The Dance: Jon called me up and said, "We're going dancing tonight. We're getting dressed up in the most disgusting outfits we can find and just making fools of ourselves. Are you in?" Without hesitation I agreed and got ready. 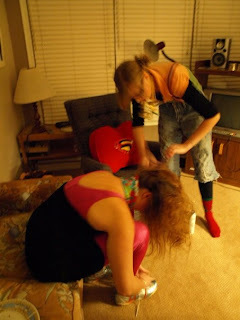 When I arrived at Jon's place I was welcomed by a crowd of friends dressed with wigs, 80's spandex outfits, leather jackets, suspenders, teased hair and bag dresses. They looked hideous, yet absolutely fabulous. 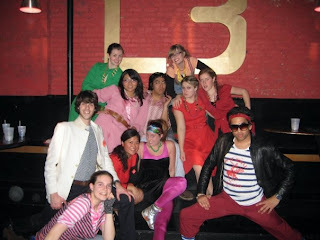 We headed out on the town and ended up at L3, a dance club in downtown St. Catharines. It was hopping with young, hip dancers, unprepared for the crowd coming in. We immediately took over the dance floor and started to dance, and man were we dancin'! It was so hilarious because though we looked horrible, it was obvious that we were having the time of our lives. This experience taught me what it means to really dance, giving it all you can. I would definitely attribute a big part of this experience to our outfits. 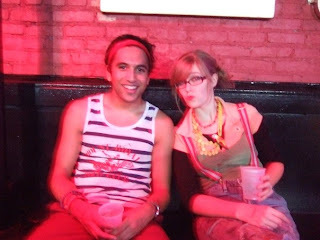 It was in those suspenders and with those spandex that we were really, truly dancin'. In my books, location is huge! As I've mentioned before, I've danced in quite a few places and some of my favourite locations have been in the middle of a grass field, in a church sanctuary, and in a casual living room (I know. Not your typical dance locations). This weekend, however; I encountered one of my not-so-favourite locations, at least not on a Saturday night. 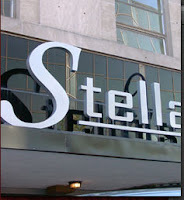 Stella's is a nightlife hot spot. It generally attracts an older crowd and the establishment is known for its strict dress code. This past weekend, one of the girls from my class was celebrating her birthday at Stella's. Some of my ladies were going and so I thought, "what a great opportunity to dance". I went alone around 11:10 p.m. to meet up with my friends. Of course being the practical dancer that I am, I didn't bring a coat, but being the neive dancer that I am I didn't realize that there would be a thirty minute line-up OUTSIDE of Stella's. So I waited and waited and finally made it inside, after paying the $5 cover. Shivering and annoyed, I pushed my way through the packed crowd to find my dear friends in the VIP lounge. 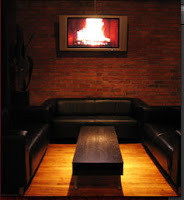 The VIP lounge is basically a reserved corner of the room, roped off for parties or the like. When I got there I was told that I could have walked right past the lineup and wouldn't have had to pay the cover if I would have told them which party I was with. Ahg! Despite my increased frustration and frozen feet, I decided that I was there to dance and so that is what I did. But the location was not ideal. The VIP lounge quickly filled with who knows who, and the four of us who knew each other, soon were forming a line dance between the couch and the table. It became really difficult for me to really dance. However, I do want to give honourable mention to Miss Dalton, who as soon as I got there was the first to show me her fabulous dance moves. She was confident that the best way to dance was to dance like nobody was watching. Miss Dalton, you were truly dancin'! Thank you for showing me how it's done. When you're on the dance floor are you dancing, moving to the beat, or are you dancin', holding nothing back and dancin' it out? 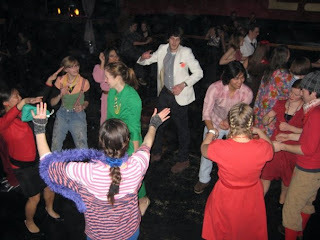 This blog is here to give you my criteria for ways to really dance it out. Hi there. I love blogs, creating blogs, contributing to blogs and most of all customizing blogs. Blogger is one platform that I use, however I am also familiar with Wordpress.com and am a quick learner of many online communication tools. For more about my past experiences, abilities and skills take a moment to look at my online portfolio for a full picture of my resume. www.suzanneveenstra.wordpress.com.